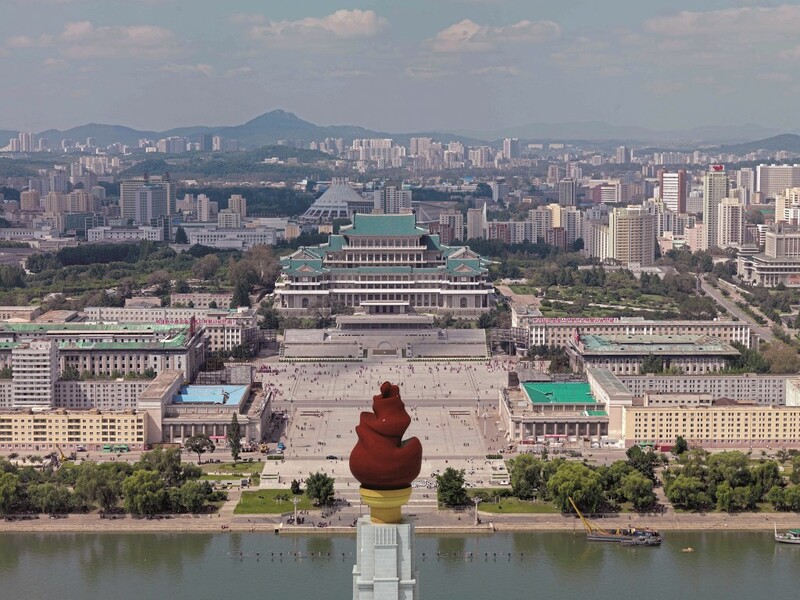 “Reading Images: Crow’s Eye View” is a reflection on a series of images from Crow’s Eye View: The Korean Peninsula, an upcoming exhibition that reprises work from the Korean Pavilion at the 2014 Venice Biennale of Architecture, which was awarded the Golden Lion for Best National Participation. For the first time, Crow’s Eye View brings together images, texts, and objects of the architectures of both North and South Korea. A unified entity for more than a millennia, the aftermath of World War II witnessed the division of the Korean Peninsula into two polarized countries. Over-simplified perspectives have long obscured both the differences and similarities between the two Koreas. Eschewing politically motivated clichés, Crow’s Eye View employs architecture as an instrument to construct new imaginaries and narratives for Korean and global communities. “Reading Images: Crow’s Eye View” invites participants to look critically at the possibilities hidden behind the images presented at the exhibition. Each participant will present for 7 minutes, reflecting on issues related to monumental architecture, the demilitarized zone, the use of images in the construction of utopian scenarios, the role of architecture in the formation of the nation-state, and critical curatorial practice. Crow’s Eye View will open to the public on September 10th at Tina Kim Gallery in Chelsea. Alessandro Belgiojoso was born in 1963, in Milan. He lives and works in Italy and abroad. Since 2006, his work has focused on the concept of boundaries and the urge to overstep their limits, exploring socio-cultural comparisons and the ongoing dialogue between different cultures and geopolitical meanings. In 2007, at Forma Foto, Milan, he exhibited a body of work taken in North and South Korea, and presented his book Korea, an Impossible Journey? Thanks to the support of the Italian Ministry of Foreign Affairs, this project managed to cross the otherwise impenetrable border between the two Koreas, and involved exhibitions and presentations of the book in both North and South Korea, and also in the North Korean Embassy in Rome (2008) and in the South Korean Consulate in Milan (currently). The project was a part of the Korean Pavilion, winner of the Golden Lion at the 2014 Venice Architecture Biennale. This long-term project is still in progress. Nick Bonner is the Director of Koryo Group, specializing in travel, art, architecture, film and cultural exchange in North Korea. He first visited North Korea as a lecturer in landscape architecture in 1993. The same year he and his colleague Joshua Green set up Koryo Group. Visiting Pyongyang over twenty years has enabled Bonner time to experience the city both as a showcase of social architecture but also as a living and working environment. Bonner has significant collections of North Korean art from the 1950s to the present. Bonner has also produced three documentaries on North Korea: A State of Mind (2004), The Game of their Lives (2005), and Crossing the Line (2006). In 2006, together with producer and co-director Anja Daelemans (Belgium) and producer Ryom Mi Hwa (DPRK), he co-directed Comrade Kim Goes Flying, which is North Korea’s first film made for pure entertainment and the country’s first “girl power” movie. The film premiered at the 2012 Busan International Film Festival. This was the first screening of a North Korean feature film to a South Korean public audience. He then organized the return of the DPRK 1966 World Cup team to the UK in October 2002, which remains North Korea’s biggest cultural event with Europe. Bonner is also the international coordinator for the biannual Pyongyang International Film Festival, and most recently, has been asked to work with North Korean artist and architects on an exhibition on city sustainability, particularly in regard to urban greening. Marco Bruno is an architect, an unaware artist, and a motorcycle enthusiast. Together with Simone Carena he runs MOTOElastico, a multidisciplinary design practice based in Seoul since 2001. He is currently teaching Interdisciplinary Design at Virginia Commonwealth University in Doha, Qatar. Minsuk Cho is the founding Principal of Mass Studies. Since 2003, he has led the Seoul-based practice with architectural projects ranging in a spectrum of context, scale, and program. He is also an active speaker at design and architecture symposiums worldwide, simultaneously exhibiting his works since the late 90s at: Vitra Design Museum’s Open House (2006-08), New Trends of Architecture in Europe and Asia Pacific (2006-07), Venice Architecture Biennale (2004/2010), Shenzhen & Hong Kong Bi-City Biennale of Architecture & Urbanism (2011), MAK, Vienna (2013), and Museum of Art and Design, New York (2013-14). In 2011, Minsuk Cho co-curated Named Design with Anthony Fontenot for the Gwangju Design Biennale, directed by Seung H-Sang and Ai Weiwei. In June 2014, Cho won the Golden Lion Award for the Best National Pavilion as the commissioner of Korean Pavilion in the Venice Architecture Biennale. Hyungmin Pai is professor at the University of Seoul. He received his Ph.D from MIT and is a two-time Fulbright Scholar. He is author of The Portfolio and the Diagram, Sensuous Plan: The Architecture of Seung H-Sang, and The Key Concepts of Korean Architecture. He was a curator for the Korean Pavilion at the 2008 and 2014 Venice Biennales, of which the latter was awarded a Golden Lion. He was Head Curator for the 4th Gwangju Design Biennale and a guest curator for numerous international exhibitions in London, Berlin, Istanbul, and Seoul. He is presently on the Presidential Committee for the Hub City of Asian Culture, and serves as Visiting Director for the Asia Culture Center. Yehre Suh is interested in theoretical and design investigations on architecture and the city as a means to investigate the social and political constructs of our environments. She is the Principal of the Office of Urban Terrains and an Assistant Professor of Urban Design at Seoul National University’s Graduate School of Environmental Studies in Korea. Dongwoo Yim is the principal and co-founder of the architecture and research firm PRAUD in Boston, and a lecturer at Rhode Island School of Design (RISD), where he teaches seminar and design studios. He received a Master of Architecture in Urban Design at Harvard University Graduate School of Design (GSD), and a Bachelor’s degree at Seoul National University. He is the co-author of North Korean Atlas, and author of Pyongyang and Pyongyang After.